Osteopathy is a system of diagnosis and treatment for a wide range of medical conditions. It works with the structure and function of the body, and is based on the principle that the well-being of an individual depends on the skeleton, muscles, ligaments and connective tissues functioning smoothly together. It is suitable for everyone from the young to the not-so-young, both during and after pregnancy and for those of us who suffer from aches and pains. Your first appointment will last for around 60 minutes as we talk through your medical history and perform a number of relevant tests before diagnosing and treating. Follow-up appointments last 30 minutes. For your body to work well, its structure must also work well. So we work to restore your body to a state of balance, without the use of drugs or surgery. Osteopaths use touch, physical manipulation, stretching and massage to increase the mobility of joints, to relieve muscle tension, to enhance the blood and nerve supply to tissues, and to help your body’s own healing mechanisms. We’ll also provide advice on your posture and prescribe exercises to aid recovery, promote health and prevent symptoms recurring. We can treat anyone from the young, older people, manual workers, office professionals, pregnant women, children to sports people. We see a wide variety of conditions, including back pain, repetitive strain injury, changes to posture in pregnancy, postural problems caused by driving or work strain, the pain of arthritis and minor sports injuries. 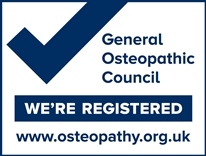 All osteopaths in the UK are regulated by the General Osteopathic Council (GOsC). The GOsC is the statutory body responsible for the professional, similar to that of the General Medical Council for the medical profession. It is a criminal offence for an individual to claim to be an osteopath who is not registered with GOsC. Registered Osteopaths are required to undertake a four or five-year honours degree programme at a General Osteopathic Council (GOsC) recognised University or School of Osteopathy. 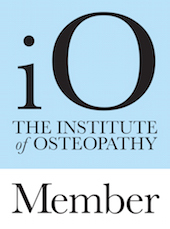 Registered osteopaths expand their profiencies with mandatory continuing professional development.